Exhibition is open to the public and free of charge! Caroline Clerc arranges materials for her installation piece that will be unveiled on June 26th. 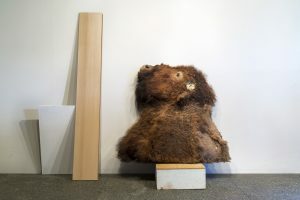 Past installation work with construction material and taxidermy. The Caetani Cultural Centre and the Allan Brooks Nature Centre are pleased to co-host an artist talk and exhibition by visiting Los Angeles photographer Caroline Clerc on Tuesday, June 26, from 7 – 9 pm at the Caetani Cultural Centre. For the past two months, Caroline has been visiting favourite places throughout the North Okanagan and Interior, often suggested by locals, to document and gather images for her project as part of the Fresh! AIR art and environment program. This will be the first exhibition in the newly upgraded public space in the Caetani house. The house has been under construction for most of the winter for the installation of a new sprinkler system, new heating and cooling systems, and upgraded electrical as part of its ongoing Open House Project. 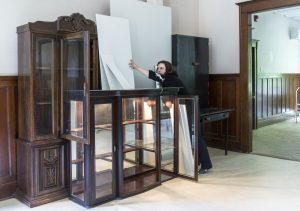 The artist has utilized the space within the main floor of the historic house to play upon her title, “From things that came before…” to construct an installation that explores ideas about the archive and display. Empty exhibition cabinets and construction materials found within the Caetani Centre Salone area are reconfigured and paired with photographs of taxidermy from the Allen Brooks Nature Centre. These static containers are combined with constructed photographs of landscapes in a state of transition. The exhibition problematizes the act of looking and disrupts the idea of understanding one’s relationship to the environment or to nature. These displays are not what they should be. In this work, looking, seeing, and understanding are not constants, rather, they are constantly shifting. The exhibition installation will take place in the historic Salone area, located on the main floor of the Caetani Cultural Centre, and will run for three days only from June 26 – June 29, from 9 am – 4:30 pm daily. The event is free of charge, and the public is welcome. Caroline Clerc is the first artist in a series of three visiting artists for the 2018 Fresh! AIR artist-in-residence series this summer. Read more here. Caroline is visiting the area from Los Angeles, California. She is part of the faculty at the University of Southern California, Roski School of Art and Design. She holds an MFA in Visual Arts from the University of California, Santa Barbara. She has taught and exhibited her work extensively, and has completed artist residencies in Mexico, New York, Norway, Italy, and Montana. See more of Caroline’s past work on her website here. The Fresh! AIR program is a partnership between the Caetani Cultural Centre and the Allan Brooks Nature Centre. The theme combines art and the environment, exploring issues of conservation, nature, culture, social issues, etc. The artist receives a studio workspace located at the Allan Brooks Nature Centre, receiving support and guidance about North Okanagan flora and fauna, and while in our area they stay at the Caetani Cultural Centre. Read more about Caroline’s artist residency at Caetani here!